Welcome to the website for 967 (BAe Warton) Squadron of the Air Training Corps. The ATC is part of the Air Cadet Organisation (ACO), better known as the ‘Air Cadets’. We’re a UK-wide Cadet force with more than 40,000 members aged between 12 and 20 years. The ATC is sponsored by the Royal Air Force and can give you hands-on experience of activities and courses that will challenge and develop your skills to help you succeed in whatever you want to do. 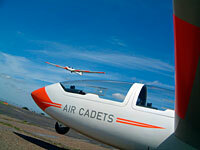 There is so much to the Air Cadets, so why don’t you have a look around our site.